The content of Revelation 4, 5, and 6 deals with the "book written within and on the backside, sealed with seven seals" mentioned in Revelation 5:1.
raiment; and they had on their heads crowns of gold” (Revelation 4:4). You will find these twenty-four elders mentioned elsewhere in Revelation. We already met one of the elders in our discussion of the “great multitude” in Revelation 7. In Daniel 7, we read, “I beheld till thrones [plural] were cast down [‘thrones were placed (for the assessors with the Judge)’ Amplified], and the Ancient of days did sit, Whose garment was white as snow, and the hair of His head like the pure wool: His throne was like the fiery flame, and his wheels as burning fire” (Daniel 7:9). We will notice similarities between Revelation 4 and 5 and Daniel 7. While Daniel 7:9 tells us that there were “thrones” put in place, we are not told how many. If we take into consideration Revelation 4 and 5 where there are twenty-four seats (thrones? ), we might conclude there are twenty-five seats or thrones, which includes the one the Ancient of days (Elohim) sits on. We want to find out as much as possible about the twenty-four elders. “And when He [Yahushua] had taken the book, the four beasts and four and twenty elders fell down before the Lamb, having every one of them harps, and golden vials full of odors, which are the prayers of saints. And they [the twenty-four elders] sung a new song, saying, Thou art worthy to take the book, and to open the seals thereof: for Thou wast slain, and hast redeemed us to Elohim by Thy blood out of every kindred, and tongue, and people, and nation; and hast made us unto our Elohim kings and priests: and we shall reign on the earth” (Revelation 5:8-10, emphasis added). These twenty-four elders have been “redeemed” or ransomed unto Elohim by the blood of the Lamb. We have no evidence that any other worlds have ever fallen into sin, therefore the inhabitants of the other worlds in the Universe do not need to be redeemed. These elders are from the earth and are now in heaven and someday they “shall reign on the earth.” Appendix B addresses the state of the dead and what happens to people when they die. We know from the Scriptures that three men never saw the corruption of death. They are now in heaven for the first two were translated, without experiencing death, and Moses was resurrected shortly after having died. But who are these twenty-four redeemed elders? We read in Matthew, “Yahushua, when He had cried again with a loud voice, yielded up the ghost. And, behold, the veil of the temple was rent in twain from the top to the bottom [the earthly ‘daily’ ended]; and the earth did quake, and the rocks rent; and the graves were opened; and many bodies of the saints which slept arose, and came out of the graves after His resurrection, and went into the holy city, and appeared unto many” (Matthew 27:50-53, emphasis added). We are not told how many were resurrected at that time, but we can assume that there were at least twenty-four, unless Enoch, Elijah and Moses are a part of the twenty-four elders. “And I beheld, and I heard the voice of many angels round about the throne and the beasts and the elders: and the number of them was ten thousand times ten thousand, and thousands of thousands” (Revelation 5:11, emphasis added). Compare what it says above to Daniel 7:10. “A fiery stream issued and came forth from before Him: thousand thousands ministered unto Him, and ten thousand times ten thousand stood before Him: the judgment was set, and the books were opened” (emphasis added). Are we seeing the same scene pictured in these two verses from Revelation and Daniel? In Ezekiel 1, the four beasts surround the throne of Elohim, but the elders are not there nor are any additional thrones. Neither are the thousands of thousands or the ten thousand times ten thousand angels pictured there. Revelation 5:11 and Daniel 7:10 are the only two instances in the Bible where Elohim’s throne is present with the thousand thousands and ten thousand times ten thousand angels and the twenty-four elders; this leads one to believe that they are describing the same event. In Daniel 7:10, we are told, “The judgment was set, and the books were opened.” On the earth, we have juries consisting of one’s peers in court cases, so in the heavenly tribunal, we have a jury of our peers; those who have lived on earth, observing the proceedings. The twenty-four elders are our peers and come from “every kindred, and tongue, and people, and nation” (Revelation 5:11) and are observing as earth’s inhabitants are being judged along with Elohim as we shall discover in our study of Revelation 14. We discovered in our study of Daniel 7 that the judgment began in 1798: “The judgment was set, and the books were opened” (Daniel 7:10). “But the judgment shall sit, and they shall take away his dominion” (Daniel 7:26). The time frame for the vision given in Revelation 4 and 5 is also 1798. The seals could not be opened before that time because it is during this scene that Yahushua receives the book sealed with seven seals. Yahushua was found worthy to begin to open the seals. “The Lion of the tribe of Judah, the Root of David hath prevailed to open the book, and to loose the seven seals thereof. And I beheld, and lo, in the midst of the throne and of the four beasts, and in the midst of the elders, stood a Lamb as it had been slain, having seven horns and seven eyes, which are the seven Spirits of Elohim sent forth into all the earth, and He came and took the book out of the right hand of Him [Elohim] that sat upon the throne” (Revelation 5:5-7). Books or scrolls or rolls were sealed in ancient times to keep the contents from being tampered with so the ones that it was being sent to could read it with its original content. One by one the seals of the book that Yahushua took from His Father are removed, and as they are removed a progression of events on earth is seen taking place. The first three seals are in the past, and we are waiting for the fourth seal to be removed. The seventh seal is removed once the redeemed are in heaven and then the book itself can be opened. When it is opened we are told there is silence in heaven for about a half an hour. If Yahushua took the book from the Father in 1798 and began unsealing it then or shortly after, what do the seals reveal to us as they are opened? “And I saw when the Lamb opened one of the seals, and I heard, as it were the noise of thunder, one of the four beasts saying, Come and see. And I saw, and behold a white horse: and he that sat on him had a bow; and a crown was given unto him: and he went forth conquering, and to conquer” (Revelation 6:1-2, emphasis added). “Thy bow was made quite naked, according to the oaths of the tribes, even Thy word” (Habakkuk 3:9, emphasis added); the “bow” refers to the Word of Elohim. Shortly after 1798, mission societies were just beginning to be founded, and Elohim’s Word was going forth into the world in an unprecedented manner. “In 1804 the British and Foreign Bible Society was organized. This was followed by similar organizations, with numerous branches upon the continent of Europe. In 1816 the American Bible Society was founded . . . The proliferation of Elohim’s Word in the early years of the nineteenth century corresponds to the opening of the first seal. “And he went forth conquering, and to conquer” (Revelation 6:2). “And when He had opened the second seal, I heard the second beast say, Come and see. And there went out another horse that was red: and power was given to him that sat thereon to take peace from the earth, and they should kill one another: and there was given unto him a great sword” (Revelation 6:3-4, emphasis added). “Think not that I am come to send peace on the earth. I came not to send peace, but a sword” (Matthew 10:34, emphasis added). “For the word of Elohim is quick, and powerful, and sharper than any two-edged sword” (Hebrews 4:12, emphasis added). Elohim’s Word was accomplishing its mission towards those who accepted it, and it had its effect upon those who were rejecting it. Following the dissemination of the Word of Elohim, there followed what is known as the “Great Awakening.” Those who had been in darkness were awakening to the light of the truths of Elohim’s Word. The second seal was the result of the first seal. We shall see that the third seal is the result of the first two seals. “And when He had opened the third seal, I heard the third beast say, Come and see. And I beheld, and lo a black horse, and he that sat on him had a pair of balances in his hand. And I heard a voice in the midst of the four beasts say, A measure of wheat for a penny, and three measures of barley for a penny; and see thou hurt not the oil and the wine” (Revelation 6:5-6, emphasis added). Many Court Houses in the United Sates have what they call Lady Justice atop them holding “a pair of balances” in her hand. The balances indicate that judgment and hopefully justice is taking place within. “Thou art weighed [judged] in the balances, and art found wanting” (Daniel 5:27). “And, behold, I will give to thy servants, the hewers that cut timber twenty thousand measures of beaten wheat, and twenty thousand measures of barley, and twenty thousand baths of wine, and twenty thousand baths of oil.” “Now therefore the wheat, and the barley, the oil, and the wine, which my lord hath spoken of, let him send unto his servants” (2 Chronicles 2:10, 15, emphasis added). These were the wages paid to “the hewers” of wood for Elohim’s Temple, built by Solomon. It was not Solomon’s Temple! It was Elohim’s Temple! The wheat, barley, wine and oil are the same items we see pictured in Revelation 6:6. Putting together verses 5 and 6 of Revelation 6, we come up with a message that contains judgment and the wages paid to the builders of Elohim’s Temple. The result of seals one and two was a movement which had a judgment hour message and an understanding of the sanctuary service though somewhat limited. This was a unique message unlike any other message ever given to the world, based on judgment and the sanctuary service, but like all the previous Protestant movements, they did not continue to advance in the light of Elohim’s Word; they failed to give the trumpet a certain sound. “For if the trumpet gives an uncertain sound, who shall prepare himself to the battle?” (1 Corinthians 14:8). This movement became like all the earlier Reformation movements, and they eventually put their beliefs into a creed and did not continue to advance in the understanding of truth as Elohim tried to give them additional light. They failed to continue to reform, conforming to the Word, and instead they conformed to the world and have since slid backwards into errors that had been previously corrected. As a result of seal three, there will be a people, the 144,000, ready when the fourth seal is opened. See chapter on Revelation 7. Ezekiel 14:21, 23 tells us, “For thus saith Yahuwah Elohim; how much more when I send My four sore judgments upon Jerusalem, the sword, and the famine, and the noisome beast, and the pestilence, to cut off from it man and beast . . . and you shall know that I have not done without cause all that I have done, saith Yahuwah Elohim” (emphasis added). The “time of trouble” spoken of in Daniel 12:1 will be a time of crisis when most important decisions will have to be made by every individual still alive. “Multitudes, multitudes in the valley of decision: for the day of Yahuwah is near in the valley of decision” (Joel 3:14). “Choose you this day whom ye will serve” (Joshua 24:15). These “four sore judgments” (Ezekiel 14:21) mentioned in the Old Testament which came upon ancient Israel are the same “four sore judgments” mentioned in Revelation 6:8 which will come upon the earth causing “the fourth part of the earth” to be killed by those judgments. Even though Elohim says I will “send My four sore judgments,” it is not Elohim doing the killing; rather, He will be removing His divine protection that allows the destruction He has been preventing to occur; see chapter on Revelation 8, in which this principle of Elohim was first discussed. In the Old Testament, wherever this terminology was used, we can see Elohim removing His protection from the nation of Israel and the surrounding nations coming and bringing havoc upon the land of Israel. From previous chapters, we have seen that once the 144,000 are sealed, the trumpets pictured in Revelation 8 begin to sound. The physical aspects of their sounding are described in Revelation 8:7-12. In Revelation 6:8 the human toll of the first four trumpets is shown, and a fourth of earth’s population, approximately two billion people, will be killed if the population of the earth at that time is eight billion. There has been nothing like this in the history of this world, excluding the flood. The first four trumpets in Revelation 8:7-12 were a meteorite shower, two asteroid impacts and a third of the earth overshadowed by the debris thrown into the atmosphere, all of which was preceded by a global earthquake that probably set off many volcanoes. What will Elohim have to do to get people ready for this tremendous time of trouble? What are your friends and neighbors going to say to you if you knew these things were coming but had not warned them? That was the question I faced when I wrote this book. “For unto whomsoever much is given, of him shall be much required: and to whom men have committed much, of him they will ask the more” (Luke 12:48). And how much more will Yahuwah require and ask of men and of women whom He has given the knowledge and understanding of what is contained in the prophetic words of the Bible? See Ezekiel 33:1-20. He does not reveal to individuals the knowledge and an understanding of His will for them to hoard it to themselves, but He expects them to be faithful in giving to the world what He has given them. Even though we are often met by scorn and scoffing and hatred, we must be faithful to our Master Who proved Himself faithful to us amid unmentionable abuse and cruelty. In Revelation 10:11, we read, “And he said unto me, Thou must prophesy again before many peoples, and nations, and tongues, and kings.” Prophesying is foretelling the future based on the Word of Elohim. Those who prophesy have never given smooth messages. People’s destinies are in the balance and there must be an earnestness (“if the trumpet give an uncertain sound who will prepare himself to the battle” [1 Corinthians 14:8]) in the message we bear. There will be some who will read this book before these things begin to happen, who will think that I have lost my mind. But I can guarantee that is not the case, as will be understood when these events take place. “Yahuwah Elohim hath spoken, who can but prophesy?” (Amos 3:8). These are not new visions that Elohim has given to anyone; they are explanations of Daniel and Revelation, which Elohim gave over 1,900 years ago to two common, ordinary people, and the events foretold in these two books are about to be fulfilled in the “last days” of earth before Yahushua returns. And as has been seen in the previous seals, the fourth seal prepares the way for the fifth seal. “And when he opened the fifth seal, I saw under the altar the souls of them that were slain for the word of Elohim, and for the testimony which they held [Revelation 1:9]: and they cried with a loud voice, saying, How long, O Yahuwah, holy and true, dost Thou not judge and avenge our blood on them that dwell on the earth? And white robes were given unto every one of them; and it was said unto them, that they should rest yet for a little season, Until their fellowservants also and their brethren, that should be killed as they were, should be fulfilled” (Revelation 6:9-11, emphasis added). During the last days, many will be killed. We have already seen in Daniel that the king of “fierce of countenance . . . shall destroy the mighty and the holy people” (Daniel 8:23-24). Revelation 20:4 tells us, “I saw the souls of them that were beheaded for the witness of Yahushua, and for the word of Elohim, and which had not worshipped the beast, neither his image, neither had received his mark upon their foreheads, or in their hands” (emphasis added). As Elohim gets blamed for many of the bad things which happen in this world, so Elohim’s people will be blamed for what happens in this world pictured under the fourth seal and the first four trumpets. As a result, many of Elohim’s people will lose their lives. The mark of the beast will also be put into effect at a later date, and many of those not accepting it will be put to death, but this will not occur until after Satan has made his appearance on earth sometime after the twenty-first month, once the New World Order has taken control. I believe from what is written in Revelation 13 pertaining to the New World Order (NWO) that they will be putting people to death prior to the appearance of Satan. “And it was given unto him [NWO] to make war with the saints, and to overcome them . . . He that goes into captivity shall go into captivity: he that kills with sword must be killed with the sword. Here is the patience of the saints” (Revelation 13:7, 9) and this is being done prior to Satan coming upon the earth and pictured as being done by the first beast (NWO) in Revelation 13. The blood of those who have been “slain for the word of Elohim, and the testimony which they held” will be avenged by Elohim during the third plague pictured in Revelation 16:4-7. “And I beheld when he had opened the sixth seal, and lo, there was a great earthquake; and the sun became black as sackcloth of hair, and the moon became as blood; and the stars of heaven fell unto the earth, even as a fig tree casts her untimely figs, when she is shaken of a mighty wind. And the heaven departed as a scroll when it is rolled together, and every mountain and island were moved out of their places. And the kings of the earth, and the great men, and the rich men, and the chief captains, and the mighty men, and every bondman, and every free man, hid themselves in the dens and in the rocks of the mountains; and said to the mountains and rocks, Fall on us, and hide us from the face of Him that sits on the throne, and from the wrath of the Lamb: For the great day of His wrath is come; and who shall be able to stand?” (Revelation 6:12-17, emphasis added). Yahushua’s return will be an awesome spectacle; and these verses do not do justice to the scene and event! This will not be a secret rapture: “And the glory of Yahuwah shall be revealed, and all flesh shall see it together: for the mouth of Yahuwah hath spoken it” (Isaiah 40:5, emphasis added). “For as lightning cometh out of the east [the direction from which Yahushua returns to the earth], and shines even unto the west; so shall also the coming of the Son of man be” (Matthew 24:27). There will be only two groups of people alive when Yahushua returns; those who are waiting in eager expectation for the return of Yahushua. That group will be saying: “Lo, this is our Elohim; we have waited for Him, and He will save us; this is Yahuwah; we have waited for Him, we will be glad and rejoice in His salvation” (Isaiah 25:9). The other group will be saying “To the mountains and rocks, Fall on us, and hide us from the face of Him that sits on the throne, and from the wrath of the Lamb” (Revelation 6:16). One group will have made peace with Elohim (repented and have been washed of their sins in the blood of the Lamb), while the other group is still at war with Him. People do not have peace in their hearts because they have not made peace with Elohim. Until they do, they will not have an inner peace. Yahushua said, “Peace I leave with you, My peace I give unto you: not as the world gives, give I unto you. Let not your heart be troubled, neither let it be afraid” (John 14:27). The lost will be extremely fearful. “But the wicked are like the troubled sea, when it cannot rest, whose waters cast up mire and dirt. There is no peace, saith my Elohim, to the wicked” (Isaiah 57:20-21). The decisions of all will be final, and the results will be eternal. Repeating what was said earlier: “Multitudes, multitudes in the valley of decision: for the day of Yahuwah is near in the valley of decision. The sun and the moon shall be darkened, and the stars shall withdraw their shining” (Joel 3:14-15). It is dangerous to put off this decision, for we have no assurance that we have a tomorrow. You may be of the 2 billion that will perish during the first four trumpets. Do not wait for a convenient season, for it may never come. “Today, if you will hear His voice, harden not your hearts” (Hebrews 3:15). Today, Yahushua is standing at the door of your heart pleading for admission, but only you can decide to invite Him in or to keep Him out (Revelation 3:20). “Remember now thy Creator in the days of thy youth, while the evil days come not, nor the years draw nigh, when thou shalt say, I have no pleasure in them” (Ecclesiastes 12:1, emphasis added). Those days are coming just as surely as you are reading this, for the verse following the one just quoted is, “While the sun, or the light, or the moon, or the stars, be not darkened” (Ecclesiastes 12:2). This will be taking place under the sounding of the fourth trumpet (Revelation 8:12). 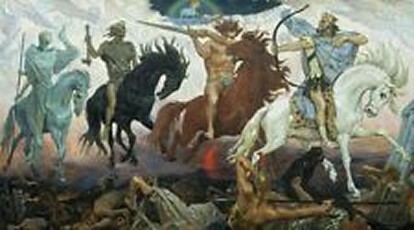 When the scenes pictured under the sixth seal (Revelation 6:12-17) occur, it will be too late to change one’s mind, but it is not too late today. Go, Tell the World of Their Danger! In Revelation 8:1, we read, “And when he had opened the seventh seal, there was silence in heaven about the space of half an hour.” This verse is misplaced in Revelation 8; it should be verse 18 of Revelation 7. The sixth seal is the return of Yahushua and when He returns to heaven, the redeemed of this earth are taken to heaven with Him. The seventh seal is opened in the presence of “the great multitude” in heaven mentioned in Revelation 7:9-17. Why is there silence in heaven when this seal is opened? This will be addressed when we look at Revelation 20:12 and discover what is in this book that was written and has been sealed since before Elohim and Yahushua created the Universe. 1. When do the scenes pictured in Revelation chapters 4 and 5 take place? 2. Where do the 24 elders come from and what is their purpose? 3. When did the first seal take place? 4. When did the second seal take place? 5. When did the third seal take place? 6. When does the fourth seal take place? 7. When does the fifth seal take place? 8. When does the sixth seal take place? 9. When does the seventh seal take place?